I used to do this summary every year when I had a blog on LJ. I always liked it so here it is for 2014. 1. What did you do in 2014 that you'd never done before? I learnt how to knit properly. I knit a few small things rather unsuccessfully when I was a teenager and then I never tried again. Then I got hooked on our skiing holidays and haven't stopped knitting. I rented a car all by myself in Wales and I drove on the left for the first time. I didn't make any. I usually try to find a project and stick to it. For 2015 I'd like to get back to writing (here and definitely by hand, I have sadly neglected my Moleskines) and to actively live the good moments. Two of my colleagues had boys and two more friends are expecting their babies in 2015. In April, I went to Paris in France with Antonia. We had a lovely time together. 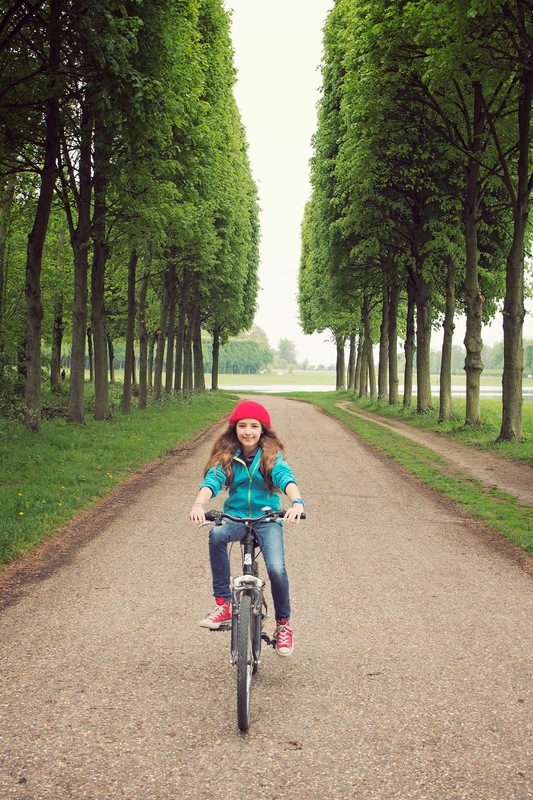 I especially liked cycling around the park at Versailles and just hanging out with her. These one-kids holidays are really so important. In July, we flew to Bristol, UK and then we spent the next 9 days in Wales. I enjoyed the road trip immensely, I think it's my favourite kind of holidays and I am really looking forward to this summer when we can travel around again. Maybe more adult people to talk to? Sometimes it's hard to be around preteenagers all the time and I think that I put too much pressure on the friends I see regularly. Maybe I need a therapist ;-), they get payed to listen. 9th of February which was a perfect day at the Hamam with Renata. 15th - 22nd of February which we spent in Tschiertschen skiing. 22th - 25th of April which I spent in Paris with Antonia. 17th to the 25th of July which was our road trip in Wales. Especially the evening in Abergavenny and the train ride the next day. 19th to the 21st of September which we spent hiking with my parents in Tschiertschen again. That I didn't lose it big time. I was close to being overwhelmed a few time but I never crashed. I agreed to so many things and I always finished them well and on time. That I could enjoy the good moments. That I really learnt a new thing and I got actually quite good at it quickly. I didn't learn yet to say no to new projects when my plate is already full. I also doubted myself too often and let myself be pushed into the defensive. Friends that were there for me again and again. There were three people who did but I don't want to dwell on it too much. It won't change anything. I spent a lot of money on holidays but the memories were so worth it. I also spent a lot on yarn but I got so many new beautiful things to wear from it, so I think it's totally ok. Apart from that I don't think I spent all that much. 15. What did you get really, really excited about? It was a year of small moments - nothing earthshaking. I tried to find one but it seems that I don't have a special song for 2014.
b) thinner or fatter? The same. c) richer or poorer? I have no idea, I need to have a look at my bank statement. Slightly richer maybe. Gone outside. I spent a lot of time on my sofa. Worried about problems that weren't ready to be solved. 20. How did you be spend Christmas? I spent the 20th of December with all my uncles, aunts and cousins for the second time in a row. It was lovely again and I was happy to be part of the preparations for the party this time. On the 24th we had Fondue Bourguinnone at my place. On the 25th we ate at my mother-in-law's. 21. What was your favourite month of 2014? I didn't have a favourite month, but my least favourite month was definitely November. 22. Did you fall in love in 2014? Downton Abbey, The Good Wife, Shameless, Gilmore Girls and Friday Night Lights were the ones I knew and loved again and again. I started watching Mom, The Killing, True Detective and Outlander which I all really enjoyed. Kind of, but I am trying to get over it. Hate is such a destructive feeling. "The Invention of Wings" by Sue Monk Kidd. It really made me think. I was a musical failure this year! Less pain. I hope my back keeps up like this! A new job. But I am quite happy with my old one. I've only been to the cinema a few times this year and I can't remember anything special. I enjoyed watching movies with my kids, we should do that more often instead of spending time seperately in front of our computers! That might be a good resolution - a movie night each week! I was 43 years old and it wasn't my favourite day of the year. I don't know if there was one big thing missing. 33. How would you describe your personal fashion concept in 2014? Lots of handknit stuff, lots of hats. I didn't buy a lot of clothes, I made them instead which was such a great feeling. My kids, talking with friends, going away on holidays, knitting. I wouldn't kick Matthew Goode off my bed, but he has his hands full with both Alicia Florrick and Lady Mary Grantham. I am glad that we didn't embarrass ourselves in front of all the world by saying yes to "Ecopop". I didn't meet anybody new but I got to know a few people more deeply and that was cool. 39. Tell us a valuable life lesson you learned in 2014.